Pac-Man Getting the Fighter Treatment? 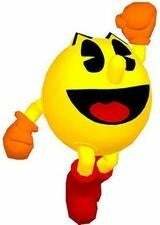 In Europe, Namco Bandai has trademarked something called "Pac-Man: Battle Royale," which sounds less like a reboot or remake of a pellet-chomper, and more along the lines of Tekken with ghosts. That's straight-up speculation. Siliconera hazarded the guess when it found the registration, and it sounds good to me, if only because it sounds better than the same old run-around (a maze).